Title-text: "Your manuscript 'Don't Pay $25 to Access Any of the Articles in this Journal: A Review of Preprint Repositories and Author Willingness to Email PDF Copies for Free' has also been rejected, but nice try." Maybe it shoulda' been ... I don't get the apostrophe after "Free" and lack of closing quotation mark. Wait ... looks like that just got fixed. I've always been a little confused at the existence of for profit journals. You'd think that universities themselves would have cornered that market, what with having direct access to most every researcher alive. duodecimus wrote: I've always been a little confused at the existence of for profit journals.You'd think that universities themselves would have cornered that market, what with having direct access to most every researcher alive. Status. If you publish in the first rank journals, your status is higher. You get more grants, tenure, etc. because grant providers and tenure committees count the number of papers in Cell and Science, not their quality or replicability (which asymptotes towards zero). With enough status, you can review papers for these journals, and join the gatekeepers. I've produced about a dozen peer-reviewed papers, with hundreds of citations for one of them. I don't do that anymore; the web connects me to more readers. With wiki technology, I can update my work and leave an audit trail to the original. Ward Cunningham is developing "federated wiki", fostering collaboration and remixing of wiki worldwide. That may be a powerful enough tool to smash the monopolies. Until then, librarians are your friends. They know the secret tunnels around and through paywalls, and use them adeptly to achieve their holy mission - knowledge for all. World-class libraries (Library of Congress, UWashington, UCBerkeley are my favorites) have rockstar librarians, who can not only find what you want, but something better that you should have asked for. People wondered why Economics Journal had a membership in the KGB Poison of the Month Club. Status. If you publish in the first rank journals, your status is higher. The perpetuation is fairly easy to understand (aside from the fact that I KNOW that my university 's server farm could host everything they produce and already store backups of for basically no additional cost), it's more so the progress towards this state. Once upon a time all research was done by writing a book, paying someone with a printing press to copy it and sending it out to all the other universities/people you cared about. Why did that stop happening/why does that process now involve freely giving it to a 3rd party to be sold as a product? I would think that any university that wants some more research money would rather not give people free money. Do universities own most journals? Why didn't the creation of the internet by universities as a research tool invalidate the need for copying? Librarians are not your friends. They want to be the juncture in the flow of information. Most very much like giving it out, some like restricting it, but it is infinitely easier when you can just bypass them. I remember back in my Uni days that I never found out if any librarian was a friend or foe. I went into the library often (at times, when I wasn't hogging the computer labs) but never borrowed a book or even asked for information. For my courses, I'd bought the requisite textbooks, etc. For both course and non-course info I had BBS/Usenet contacts/browsable content to refer to (pre-Google, pre-Yahoo, even pre-web!) and yet I had arrived with (even for a university-goer) a propensity for library-going. Of course, my home-town library mostly sated my taste for fiction (plus dipping into the [url=https://en.wikipedia.org/wiki/List_of_Dewey_Decimal_classes#Class_000_–_Computer_science,_information_&_general_works]000s[/url] - for the computing, mainly, but also various pseudoscience wierdnesses in the 001.9 area) but that was severly lacking in the campus stacks. And always a quiet niche or ten to relax in, between lectures, without the temptation of surfing Gopher or whatever it was that I might have done at that time if I'd have been in a proper computer lab. I ended up having very little to do with seeking Peer Review, due to the more practical/creative nature of my courses and not progressing to the levels of academe by which this would have started to be a bigger issue, but i must have read an awful lot of (free!) material, that had gone all the way to the bookbinding stage, for fun and/or profit! I think there's a couple reasons. The first is that there is a lot of junk science out there, both in the sense of that it's just plain BS and in the sense that the procedure, analysis, conclusions, etc. may be faulty in some way. "Better" journals are usually able to weed out this sort of stuff. They can also curate information in some way so that people looking for papers on quantum electrodynamics don't keep finding papers on quantum cryptography or something. So if you're a researcher wanting to keep up on the latest developments in your field, you maybe need to keep up on a handful of journals, plus maybe skim a few of the top generalist journals for some really breakthrough stuff. Having each university, or each researcher, publish their own results independently both loses the quality control aspect, and makes it more difficult to actually find the information that you want. 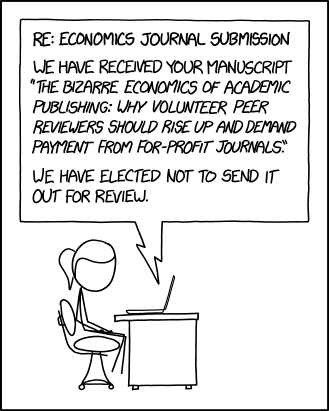 This is especially disadvantageous for small-scale researchers or universities, since there's nothing stopping a researcher from Random University from publishing in a top tier journal if their researcher warrants it, but the typical researcher in her field may not necessarily know that Random University even exists. There's also the problem that the switching costs to move to any other model, even a much better one, are very high for an individual researcher, so the status quo tends to be self-perpetuating. There are considerable benefits to publishing in tier-1 journals for an individual researcher, and funding agencies, university hiring/tenure committees, etc. do not necessarily give the same weight to other methods of publication. The institutional inertia is an almost overwhelming hurdle. That isn't to say that for profit journals are the best or even a desirable model. It's just something that's hard to get around because it's what we have. jgh wrote: So disappointed that this wasn't about comparing functional masonry linear harbour extensions with timber recreational perpendicular promenades. And is a breakwater that isn't attached to anything at either end allowed in? No no no, that's "Pier Review" you're thinking of. Totally different concept.